Keto Cheese Pie Recipe - Three Cheeses - Low Carb, Gluten Free Crust! 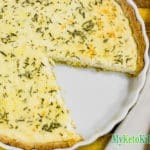 This recipe brings together 3 great cheeses to create a delicious Keto Cheese Pie. In a mixing bowl, place the almond flour. Add the cream cheese and butter and rub into the almond flour until the mixture resembles crumbs. Add the heavy cream and gently mix together. Press into the base of a 9.5in quiche dish. Bake in the oven for 10-12 minutes, until the base is cooked through, but still pale. Set aside while you make the filling. Add the feta cheese and ricotta cheese to your food processor and blend on medium speed until combined. Add the eggs, cream, rosemary, thyme and pepper and blend until smooth. Add the Gruyere and pulse until just mixed through. Pour the mixture into the base and smooth out. Bake for 20-25 minutes, until the filling is set and there is no jiggle when the pie is moved. Cut into 10 pieces and serve.